Remote control and radio communications are not new to the Dillon product line. In fact, it is the depth of Dillons experience in this area that led to meaningful innovations in the design of the EDxtreme and its optional remote Communicator. Unlike the single frequency products on the market today, the EDxtreme radio dynamometer utilizes leading edge 2.4Ghz radio frequency technology to eliminate common interference. This technology will automatically hop from frequency to frequency to establish and maintain the strongest, most reliable communication. The optional Communicator is an extremely powerful hand-held remote that can define the function and manage the operation of one or more EDxtreme dynamometers using wired or radio technologies. Through the programmable SOFTKEY interface, one Communicator can monitor multiple dynamometers within the same airspace. In multiple-link lifting arrays, the Communicator can display readings at any or all lift points and calculate the total load. Models available in capacities from 2500 to 550,000 lbf (1000 to 250,000 kgf). 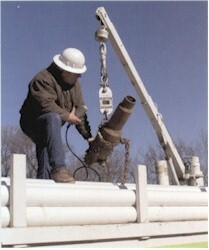 The EDxtreme exemplifies the trademark precision and rugged construction of Dillon dynamometers. Its highly refined design draws on the inherent strengths of premium-grade materials to achieve a 5:1 minimum factor of safety. While the EDxtreme may be configured for something as simple as a digital hanging scale, it offers a higher level of intelligence. With user-defined functions and sophisticated communication options, the EDxtreme readily adapts to multi-tasking operations or multilink systems capable of monitoring a series of critical stress points from a single location — it is the definition of application versatility. Superior strength and corrosion resistance – High capacity models are constructed of electroless nickelplated aircraft-quality alloy steel. Lower capacity models are anodized aircraft-quality aluminum. NEMA 4X/IP55 – The EDxtreme is clearly the choice for reliability in any environment – in-plant or out on the job site. 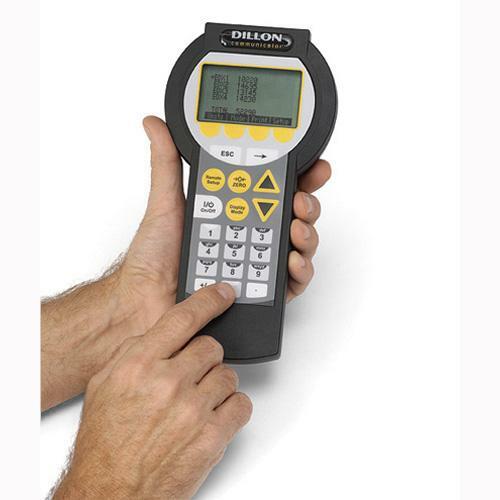 Exclusive SOFTKEY interface – Dillon has eliminated confusing menus for faster setup and simple operation. In addition to lbf, kgf and Newtons, programmable functions can correct for gravitational variations and allow the use of custom units of measurement. Battery operation – The EDxtreme is powered by twostandard C-cell batteries. Batteries are easily accessible for fast replacement. A basic stand-alone model can be easily upgraded “in-the-field” to accommodate changing needs. Remote configuration, data acquisition and single point monitoring of multiple links are all possible with the hardwired or radio communication options available with the EDxtreme. 1. Stand-alone EDx for simple, direct measurement applications. 2. Single network with one EDx radio dynamometer and Communicator. 3. Single network with multiple EDx dynamometers and one Communicator. The Communicator monitors the load at each scale, plus the total weight. 4. Multiple networks with multiple EDx dynamometers and Communicators. An RS-232 interface is standard on both the EDxtreme and Communicator for connection to a host PC. One of the foremost reasons for choosing an electronic dynamometer is added functionality. The radio or hardwired options available with the EDxtreme offer the convenience and safety of remote operation. 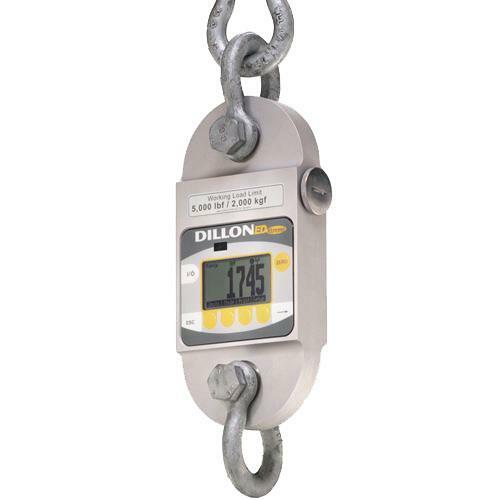 Additionally, data from the dynamometer(s) can be downloaded to a PC via an RS-232 connection for compilation and analysis or to generate hardcopy printouts. Unlike the single-frequency products on the market today, the EDxtreme radio dynamometer utilizes leading-edge 2.4Ghz radio frequency technology to eliminate common interference. This technology will automatically “hop” from frequency to frequency to establish and maintain the strongest, most reliable communications. The optional Communicator is an extremely powerful handheld remote that can define the function and manage the operation of one or more EDxtreme dynamometers using wired or radio technologies. Through the programmable SOFTKEY interface, one Communicator can monitor multiple dynamometers within the same airspace. In multiple-link lifting arrays, the Communicator can display readings at any or all lift points and calculate the total load. Proof load: 150% of capacity up to EDx-75T. 110% of capcity Edx-100T and above. Body protection: Aluminum capacities are anodized. Alloy steel capacities are electroless-nickel plated. Bearings: Unmatched repeatability attained by needle bearings in shackle pin holes up to EDx-5T. Shackle pin acts as inner race. Shackles: Forged industry standard anchor shackles. Models up to EDx-5T use precision machined shackle pin. Higher capacities use bar stock pin. Connector: Recessed sealed connector may be used for serial communications or connection to a Communicator remote. RS-232 / RS-485 communication: Print or extract data easily. Continuous output can drive a scoreboard. Confi gurable poll character. Calibration: Traceable to the National Institute of Standards and Technology. Certifi cate included with curve of readings. Passes only with three consecutive confi rming runs, with all points in specifi cation. Battery life: 320 hours typical use with two C-cell alkaline batteries. 40 hours typical with Radio Link system. Included with instrument: All include certificate of calibration, manual and batteries. Plastic carry case included for EDx-1T to EDx-50T. Higher capacities include rugged plywood storage crate. Instruments with shackles include centering spacers (EDx-20T & up) and shackle storage crate (EDx-20T to EDx-75T). Display backlight. Enclosure: Designed to NEMA 3 / IP44 with optional sleeve. Suitable for protected outdoor use. Instrument size: 9.0 x 4.6 x 1.8 inch (228 x 117 x 45mm). Accuracy: Not applicable. Only sends and receives digital information. Display: 128 x 64 dot-graphic LCD display can show full readings up to 5 instruments. Battery life: 40 hours radio or 45 wireline using four AA alkaline batteries under typical use. Connectors: Sealed connectors may be used for serial communications and wired connection to an EDxtreme dynamometer. Included with remote: Carry case and batteries. Frequency: 2.4 GHz spread-spectrum operates between 2.402 – 2.478 GHz. Continuously and automatically changes frequencies many times per second for consistent, reliable communications. Display update rate: 2 times per second with single dynamometer. Multi-instrument networks result in reduced updates. Number of networks: 63 remotes can operate independently in the same airspace with unique channels. Number of links remote can control: Up to 15 addresses are available per network channel. Configuration: Address and network channels are front-panel confi gurable. Range: Open-air – Up to 300 feet, line-of-sight. Indoors – Dependent upon environment with 150 feet common. Low power radio systems are dependent upon interference levels from other radio systems and environmental conditions. Radio devices are not suitable for all applications.